The year is 2015, and half of the Earth's population is dead, victims of the disaster called Second Impact! Answering a summons from his enigmatic father, 14-year-old Shinji Ikari arrives in the rebuilt city of Tokyo-3 just as a gigantic creature known as an Angel attacks! Forced into the cockpit of a giant bio-mechanical construct known as an Evangelion, Shinji must defend the city from the rampaging Angel or die trying! Rebuilt from t..
Shinji Ikari just woke up in his Eva unit fourteen years after starting the Third Impact. He hasn’t aged, but everything else has changed. The earth is in ruins. Rei is missing. The people he once protected treat him like a prisoner and threaten to kill him if he pilots another Eva. 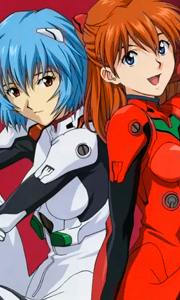 When he escapes to the remains of Nerv headquarters, Shinji meets pianist Kaworu, who is destined to be Shinji's copilot in a new dual-cockpit Eva. As the b..
Own Evangelion 3.33 - You Can (Not) Redo Blu-Ray from Deff, DVD, Blu-Ray & 4K Video Specialists - Free UK Delivery..
Own Evangelion 3.33 - You Can (Not) Redo DVD from Deff, DVD, Blu-Ray & 4K Video Specialists - Free UK Delivery..